Min: 250 to 2500 Pcs. Adjustable nylon buckle easily attaches to luggage, golf bag and backpacks. 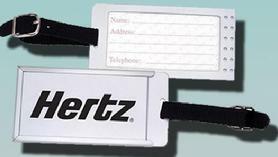 ID window fits standard business & ID cards. Material: Metal with nylon buckle. Imprint Area: 2 3/4" x 1 1/2". Special Sale Price: $0.99 Min: 250 to 2500 pcs.